These two patterns present another case of: “which came first?” Since old Imperial Catalogs present both Lustre Rose and Open Rose shapes with the number #489 preface, we feel assured that the two patterns were marketed together. Presumably, the idea that everyone likes roses governed the decision to create enough shapes/sizes/differentials on the subject to please every conceivable need. A preliminary count of the scope, offers some 18 shapes. The color range is extensive. Insufficient respect and admiration for these pieces has always been a “puzzle” for us. 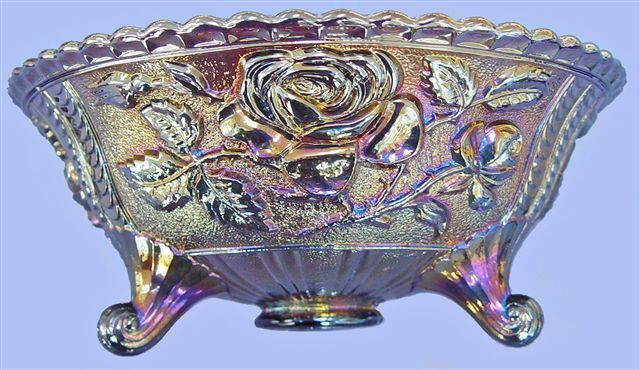 Production of some colors was abundant, but in view of the definite and extreme rarity of purple and red 11 ½” Lustre Rose fruit bowls, along with scarcity of purple 9” plates, and cobalt blue and powder blue examples in Open Rose pattern, we believe another look should be given these lovely examples of skill and workmanship! Both patterns had a long, successful run to benefit the buying public! Re: extension of the #489. It is the next couple of designations which define one “rose from another!” Please take note of the catalog ad shown in this segment. 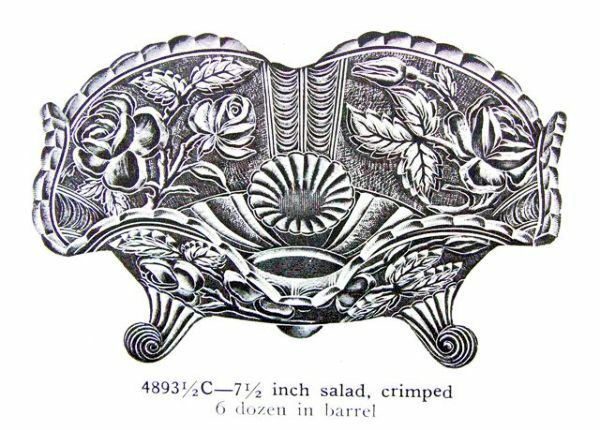 4893 ½ separates this size and design from the larger 11 ½” fruit bowl given the number #4892C. There is a 10 ½” fruit bowl having the number #4892B. All three sizes offer the Lustre Rose pattern, which is and of itself, an individual design, apart from the Open Rose pattern. Lustre Rose is footed, has 2 panels of scale-type design separating the panels of roses on the exterior. The interior displays a definite zig-zag trim just above the roses, along with a ribbing effect which extends to the rim edge. Open Rose has a collar base, all-over rose design separated by ribs on the exterior. Interior displays scallops just inside the small ribbed design along the outer edge. Rose designs are scaled to fit the various shapes, some having more roses and foliage. Differences in the fernery shape will be discussed in an upcoming segment. 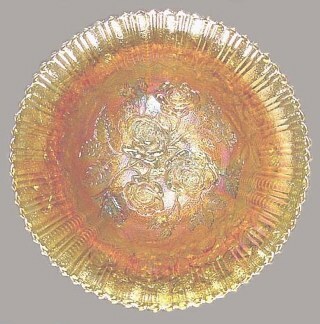 Open Rose berry bowl, large - amber, aqua, cobalt blue, smoke, marigold, purple, helios, vaseline, light blue/marigold overlay. We will have two more segments surrounding these patterns. Pertinent information is printed under each photo. the 9 in. 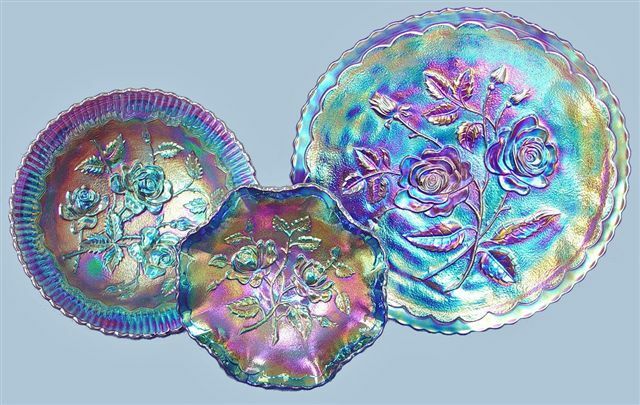 OPEN ROSE plate in purple. Exterior of 5.5 in. blue OPEN ROSE Small Berry. #4895C. Face of 7.25 in. LUSTRE ROSE footed bowl in Purple. Exterior of 7.25 in. 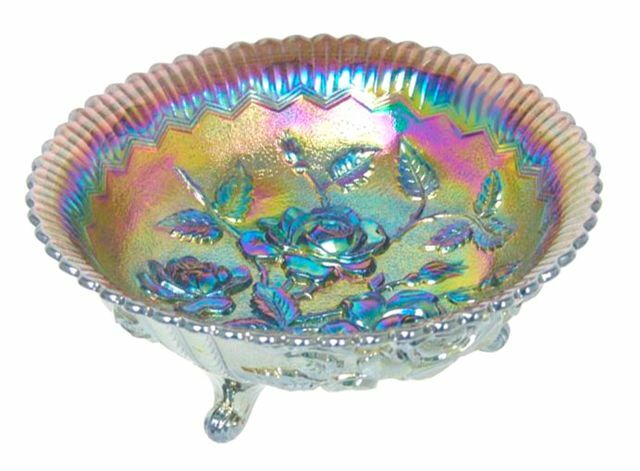 LUSTRE ROSE footed bowl, purple. 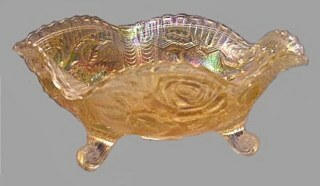 LUSTRE ROSE in 7.5 in. size-Marigold. 8-9 in. 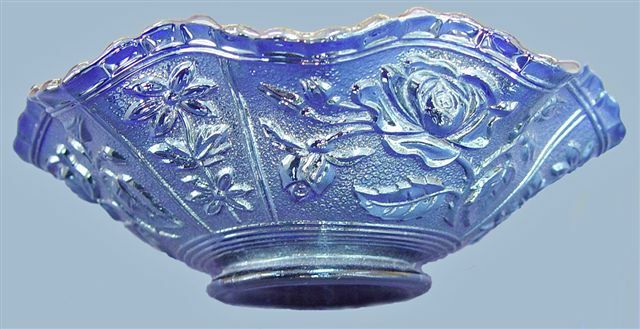 Powder Blue OPEN ROSE Berry Bowl.#4897A. 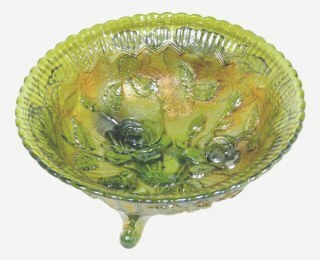 Reproductions began in the 1960s, continuing into the 1970s. 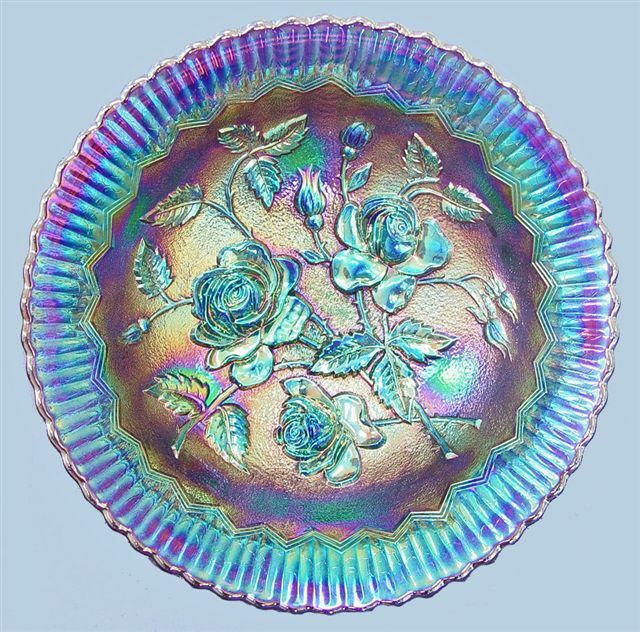 A variety of shapes, including an 11” chop plate in Open Rose, not originally produced in old carnival (which we will display in a coming segment) are now more than forty years old. Time to take another look? A lighter green, or meadow green, white and pink were included in the newer items. ALL examples were trademarked with either IG, LIG, or ALIG (provided they have not been ground off by some “enterprising” human), leaving a slightly rough, sandy area where the logo had been. Since the `70s, apparently L.E. 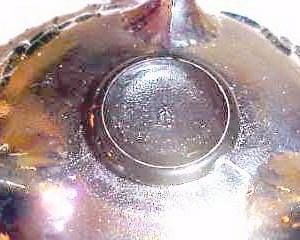 Smith Glass attained some molds, but their S mark should be evident. 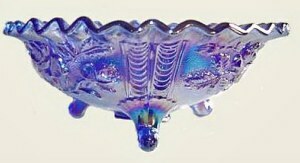 In addition to the blue bowl shown, iridized white is known. (IG) mark on bottom of 7-8 in. 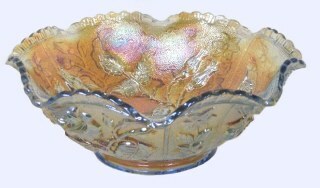 footed LUSTRE ROSE bowl. for L.E. Smith Glass Repro.. I have declared my ways, and You answered me; teach me Your statutes. Remove from me the way of lying, and grant me Your law graciously. David often extolled the value of the Word of God in his psalms. In writing Psalm 119, the shepherd-king focuses on the benefits of the Scriptures. The effectiveness of God's Word to equip us for living for Him is undeniable………and irreplaceable. The Word gives strength, understanding, and direction, equipping us for living for Him.